This Newsletter is also available in PDF format here. NPHA arrived ahead of the cherry blossoms but was similarly welcomed by Capitol Hill, National Park Service and park partner leaders. During an action-packed three days, NPHA members delivered reports on conditions of the parks and projections of visitor levels for 2013 and called for action on key ideas discussed in October at the Grand Thoughts at the Grand Canyon meeting. NPHA members gathered for an opening reception on March 17, followed by a productive Executive Committee meeting. At its March 18 Annual Meeting, NPHA members elected its Board of Directors and discussed topics ranging from recommendations of its Task Forces on Improving NPS Concessions Program, Improving WiFi and Cell Connectivity in Parks, and Retail Operations. Staff reported on the Healthy Food in Parks efforts, CONPAC, regional meetings and NPS centennial efforts. News about efforts of the National Parks Promotion Council was shared, including important coordination of federal agency participation in Pow Wow. NPHA members then used Old Town Trolleys to shuttle to the U.S. Department of the Interior, where they were joined for lunch and discussions by NPS Director Jon Jarvis and NPS Deputy Director Peggy O’Dell, Interior’s Director of External and Intergovernmental Affairs Gail Adams, and nearly a dozen additional NPS leadership team members. Jon Jarvis addressed issues from sequestration to reopening of the Statue of Liberty, from better communications between the agency and concessioners during emergencies to expansion of concessioner offerings during a more-than-three hour discussion session. Members were briefed on actions supporting the National Strategy for Travel and Tourism and on opportunities to partner with NPS and others to reach American youth, and especially Latino youth. NPHA members arrived on Capitol Hill on the evening of March 18 for discussions with U.S. Senator Mark Udall (D-CO), chair of the U.S. Senate Subcommittee on National Parks, key Congressional staffers and National Parks Conservation Association President Tom Kiernan. Following an early morning gathering for coffee and discussions, NPHA members walked to the Bipartisan Policy Center for a Bridgebuilder Session on better funding for national parks. A full report on that session is here. National Park Foundation (NPF) President Neil Mulholland spoke to NPHA members at lunch, addressing topics ranging from the Guest Donation Program to NPF’s effort on national parks centennial coins. He ended his comments with an introduction of NPS Senior Vice President David French and key members of the Grey New York team working on the development of a multi-year, multi-million dollar per annum campaign to increase support for and visitation to America’s national parks in conjunction with the 2016 centennial of the National Park Service. NPHA members were among the first participants in a series of listening sessions designed to develop Key Performance Indicators (KPIs) and to identify strategies for both energizing current park enthusiasts and reaching many Americans who are not regular visitors to parks. As the NPHA meeting neared its conclusion, the NPHA board met and took several important actions. It elected its officers for 2013-2014, returning most of the Executive Committee with the addition of Jim Houser of Delaware North Companies as Vice Chairman. It directed staff to make major improvements to the www.parkpartners.org website. It elected to return to Washington for its Fall 2013 meeting and approved plans for meetings with NPS in most regions during 2013, in some cases tied to task force and food seminar sessions. The nation has a new chief champion of the Great Outdoors – Sally Jewell, the 51st person to serve as U.S. Secretary of the Interior. She was easily confirmed by the U.S. Senate and succeeds Ken Salazar, who led the department for more than four years and has now returned home to Colorado, which he has also served as a top state official and as a U.S. Senator. Prior to her confirmation, Jewell served as President and Chief Executive Officer of Recreation Equipment, Inc. (REI). Jewell joined REI as Chief Operating Officer in 2000 and was named CEO in 2005. During her tenure, REI nearly tripled in business to $2 billion. Jewell has worked to ensure that public lands are accessible and relevant to all people from all backgrounds, and to build a connection between the great outdoors and a new generation of Americans. She was active in the America’s Great Outdoors effort and served on the National Parks Second Century Commission. Before joining REI, Jewell spent 19 years as a commercial banker, first as an energy and natural resources expert and later working with a diverse array of businesses that drive our nation’s economy. Trained as a petroleum engineer, Jewell started her career with Mobil Oil Corp. in the oil and gas fields of Oklahoma and the exploration and production office in Denver, Colorado where she was exposed to the remarkable diversity of our nation’s oil and gas resources. An avid outdoorswoman, Jewell finds time for skiing, kayaking, hiking, climbing and other activities. A national dialogue about supplementary funding strategies for national parks was held at the Bipartisan Policy Center (BPC) in Washington, D.C., on March 19. The event brought together political leaders and park advocates to identify sustainable, supplementary funding sources that can capitalize on bipartisan support for America's national parks. The session was co-hosted by the National Park Hospitality Association (NPHA) and the National Parks Conservation Association (NPCA), which had also joined to co-host the first-ever America’s Summit on National Parks in early 2012. Speakers at the session included Senator Mark Udall (D-CO), former Secretary of the Interior and Idaho Governor Dirk Kempthorne, former U.S. Representatives Norm Dicks (D-WA) and Jim Oberstar (D-MN), and former Environmental Protection Agency Administrator and former New Jersey Governor Christine Todd Whitman. Prominent pollsters Geoff Garin and Whit Ayres, co-directors of a 2012 national survey on voter attitudes toward park and Great Outdoors issues, added valuable insights into ways to use remarkable public support for parks to join diverse Members of Congress on initiatives supporting parks. At the heart of the session was a compendium of 16 white papers offering potential new and non-appropriated funding, from revised fee programs to a dedicated Penny for Parks in federal motorfuel tax to new efforts to increase philanthropic support for parks. A copy of the publication can be downloaded at http://parkpartners.org/fundingparks.html. Comments on the white papers and submission of additional funding ideas are encouraged and should be submitted by May 1 to parksnext100years@gmail.com. "We need to both challenge and empower the agencies caring for America's national parks and other special places to develop sustainable plans to supplement traditional appropriations of general tax revenues. There are ways to sustain a strong system of national parks not only for the next few years but long into the future - and that is what we should be doing as the National Park Service turns 100 in 2016 and embarks on efforts to stay relevant and cherished for another 100 years," said Derrick A. Crandall, NPHA Counselor. There will be cutbacks in programs serving park visitors this year. The timing and the specifics of sequestration are going to force that. In simplest terms, sequestration will force every unit of the agency and almost every program to cut spending by 6% from 2012 levels – and because the cuts were made official nearly half way through the year, the cuts will be most visible just when most parks attract peak visitation. There have been some successes in reversing late openings and facility closure announcements, but most national park units will be unable to fill regular staff vacancies or hire seasonal staff. And virtually all travel and meetings have been cancelled. And the Congressional action extending the spending CR – continuing resolution – through September 30, 2013, did not give NPS the same kind of budgetary discretion provided to the Department of Defense to shift funds between programs and units. The consequences of sequestration, and the park-by-park implementation, will grow from the roughly $130 million in initial cuts. Late openings and unmanned entrance stations will reduce entrance fee and campground fee collections. Delayed repairs this year will likely force more costly repairs in the future. Some of the announced 2013 service reductions have been overcome through volunteered services and funding – notably the efforts of the State of Wyoming and Yellowstone's gateway businesses. But the short notice and the challenge of finding the basis for agreements have proven burdensome, and the NPS leadership is cautious about reliance on emergency steps which could be misinterpreted by Congress and others as indicating that offered safety nets can be counted on year after year. It is clear that concessioners have an opportunity to define offers for long-term assumption of NPS efforts at the individual park level, and can count on regional and national support for careful consideration of these requests – because the outyear budgets appear far from rosy. On a positive note, the FY2014 budget proposal is based on FY2012 NPS spending, and provides a slight increase in operating funds over that base year. Director Jon Jarvis testified before the House Interior Appropriations Subcommittee on April 12 that the requested funding, while still requiring frugality, is unlikely to force the significant cuts expected in 2013. His testimony is at www.c-spanvideo.org/program/312074-1. Plans to hold a meeting of the NPS Concessions Management Advisory Board (CMAB) in Washington, D.C., in conjunction with the 2013 Annual Meeting of the National Park Hospitality Association (NPHA), were squashed by sequestration. Meetings and most travel were cancelled Department-wide less than two weeks before the planned March 20 meeting. Attempts to reinstate the meeting, since it is funded by franchise fees which are exempt from sequestration, failed. “We were very disappointed,” said NPHA Chairman Joe Fassler. “CMAB is tackling topics of great importance to the National Park Service, concessioners and the public – including strategies for encouraging and rewarding concessioner excellence, defining visitor services appropriate for the 21st Century, and improving NPS/concessioner communications and teamwork during emergencies. We were looking forward to good exchanges and helping to craft recommendations for action by the Director and the Secretary of the Interior,” he added. CMAB plans to create committees to work on these key issues in advance of its next meeting, likely in the fall of 2013. An interim webinar or conference call is anticipated. The 100th anniversary of the National Park Service (NPS) in 2016 is approaching rapidly – and many key efforts are underway. The internal preparations by NPS are highlighted in A Call to Action, issued first in 2011 and now being updated annually in conjunction with Founder’s Day, August 25. More information on “C2A” is available here. The National Park Foundation has acted on a request of the agency to raise funds to hire a top agency to design a Centennial Campaign – the Grey Group of New York. Now well into its research and listening stage, Grey is expected to offer recommendations on KPIs – Key Performance Indicators – for the campaign by this summer and outline a multi-year, multi-channel and multi-million dollar per annum proposal by this fall. To read more about the Grey effort, click here. To help guide Centennial efforts, including the Grey effort, NPS Director Jon Jarvis is assembling a potent Centennial Advisory Committee under the umbrella of the National Park System Advisory Board (NPSAB). Chaired by NPSAB member Gretchen Long, the committee will have some 25 members including concessions community representatives. A small executive committee will help manage the committee, and NPHA Counselor Derrick Crandall will be a member of that group. The executive committee will meet in late April and the full committee is expected to meet for the first time in May. In addition to commenting on the Grey campaign efforts, the new Centennial Advisory Committee is expected to help NPS respond to more than 200 unsolicited offers to develop centennial programs and events – from top national organizations like the Smithsonian to companies and local event organizers. A key decision facing the NPS is whether to formally invite centennial offers. NPS Director Jon Jarvis signed a memorandum in early 2013 creating the Authorized Concessioner Mark Program. The Mark is for voluntary use by NPS concessioners in good standing in a variety of promotional and informational applications. The Mark, which incorporates the NPS Arrowhead, demonstrates the business relationship between the NPS and its concessioners and assures visitors that facilities and services bearing the Mark are of high quality and authorized by the National Park Service. NPHA initially requested creation of the Mark in the fall of 2009 as a visitor service and was notified of the availability of the Mark on March 19, 2013. 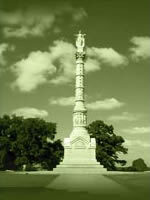 Information on use of the Mark is available at http://concessions.nps.gov/news_concessioner_mark.htm. Additional information is available from Kurt M. Rausch, Branch Chief, Contract Management, NPS Commercial Services Program, at 202.513.7202. Recreation fees are an important source of funding for federal agencies – a big change since the enactment of Fee Demo in 1996. Fees now total some $300 million each year – entrance fees, campground fees, daily use fees and more, with almost $200 million associated with the National Park Service. Five federal agencies are covered under the authority of the Federal Land Recreation Enhancement Act of 2004 (FLREA) – but not the U.S. Army Corps of Engineers. In general, the fee program is regarded as a success although it has some controversies associated with specific fee sites. Federal agencies have worked government-wide on several fee initiatives including fee-free days and a new free pass for those on active duty in the military. In its first year, 130,000 free annual passes were given to qualifying active duty military. There was concern that this new free pass would reduce overall fee revenue. However, NPS reports that its total fee revenue of more than $195 million in 2012 was up 4% from 2011. FLREA fee authority sunsets in December 2014. The Administration proposed a one-year extension of FLREA as part of its FY 2014 budget proposal and then separate action by the Congress to enact long-term fee authority. Recreation interests have been discussing needed changes, including during conversations at the 2012 and 2013 Partners Outdoors sessions and in a white paper prepared for a meeting in March 2013 at the Bipartisan Policy Center (see http://parkpartners.org/fundingparksfees.html). You are invited to review the paper and the options it raises and to then submit comments and additional ideas to be incorporated into the revised version of this paper. Comments should go by May 1 to parksnext100years@gmail.com and the lead author of the paper, Destry Jarvis, at destryjarvis2@me.com. June will once again be Great Outdoors Month with proclamations, events, awards and celebrations. Great Outdoors Month highlights the benefits of outdoor activity – including annual economic impact of more than $650 billion – and showcases the splendor of our shared natural resources, including forests, parks, refuges, and other public lands and waters. June opens the active summer vacation and recreation season and also hosts significant events engaging the public in outdoor recreation including: National Trails Day®, National Fishing and Boating Week, Welcome to the Water on National Marina Day, the Great American Backyard Campout, and volunteer events under Take Pride in America®. Great Outdoors Month helped launch the tremendously successful National Get Outdoors Day partnership, which will host events for a sixth year at sites across America on Saturday, June 8. Great Outdoors Week (June 1-9) will be celebrated in Washington, D.C., with a variety of events and award presentations, including the Sheldon Coleman Great Outdoors Award. The Great Outdoors enjoys new appreciation for its role in a sustainable economy and for helping the U.S. regain an appropriate share of the international tourism market – where success will mean hundreds of thousands of new jobs. We also have better evidence that active fun outdoors can be a potent tool in controlling healthcare costs, combating obesity, diabetes, heart disease and more. Encouraging more time in the outdoors is also becoming an important educational strategy. Proclamations are expected by the President and all 50 governors and will be available for viewing and downloading here. For more information on Great Outdoors Month, contact Tom Georgevits at tgeorgevits@funoutdoors.com. NPHA’s 2013 dues payments are now overdue. If you have not yet paid, please contact Tom Georgevits at tgeorgevits@funoutdoors.com with any questions or to obtain the necessary forms.